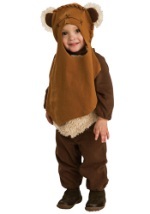 Coddle your toddler in this delectable Chewbacca costume. The detailed light brown romper is made of polyester/flannel material and has several fur attachments around the shoulders, ankles and top of the head. It velcros in the back for easy on and off. The headpiece also fastens by snaps. In addition, a sash with usable pouch slings over the costume’s shoulder. You can have your own tiny Chewbacca with this toddler costume.